I think I can officially call this post my ‘soft open’ to the new year. We are already over a week into 2016 and here I am with my very first post. And about something as simple as what brings me joy. 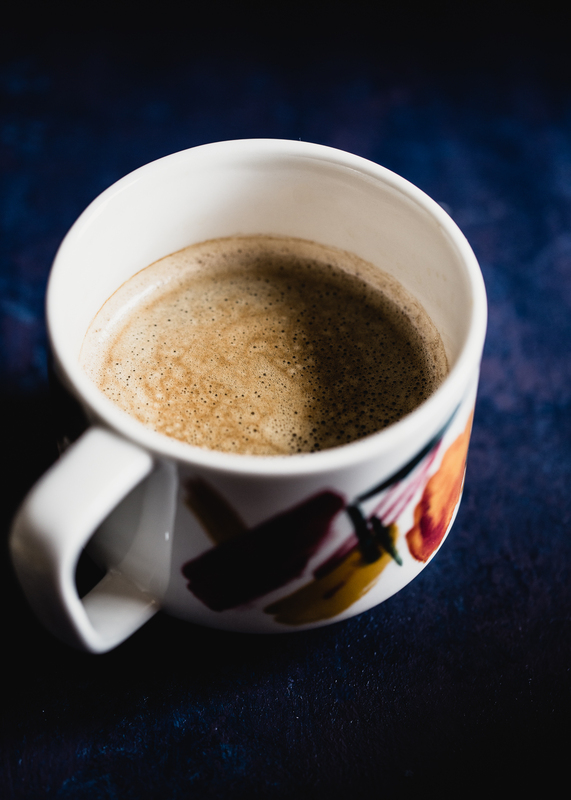 There are recipes in the works here in my kitchen, but for now, I wanted to share a few things that bring me joy, in case they might bring you the same. 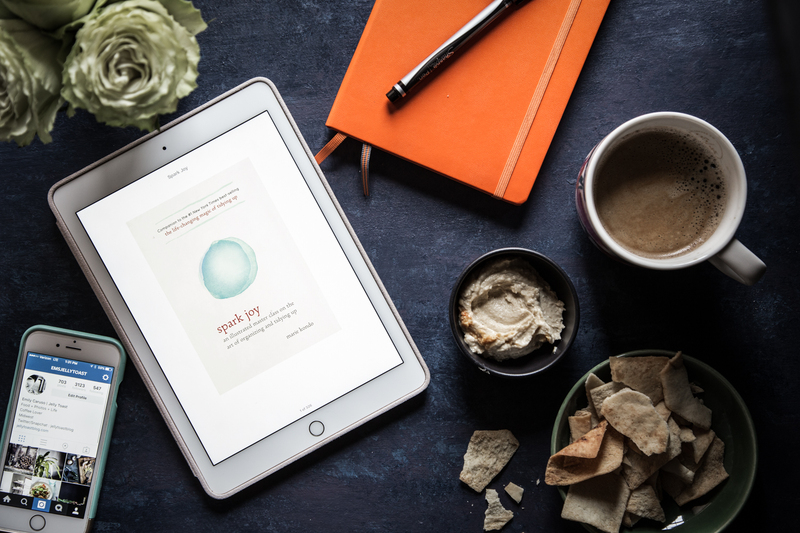 Plus there is a giveaway at the end for digital copies of Marie Kondo’s new book, Spark Joy, so be sure to look at the details at the end of the post. You may remember that last year I read Marie Kondo’s first book called, The Life-Changing Magic of Tidying Up: The Japanese Art of Decluttering and Organizing. It may seem that I am overstating things when I saw that this book was truly life-changing, but I assure it, I am not. I am a messy person by nature. At times I have wondered if I have undiagnosed focus problems, but the fact is, it is not in my nature to be neat and tidy. That doesn’t mean I don’t long to be that way. Well, last March, I came across The Life-Changing Magic book and decided to give it a read. What could it hurt? Well, I ended up listening to the audio book version, about 3 times. I listened once to get an idea for what this method was and got hooked. I listened to it again, taking careful notes on how to begin my KonMari method within my own home. And I kept listening to bits of the book as I tidied and decluttered. We lost track of just how many bags and items we got rid of, but it was as if I could hear my house groaning with relief at the rapid exit of so many things. Now, you may be thinking that even a tidy house isn’t exactly life-changing, but here is where I will disagree. After completely embracing Ms. Kondo’s method and decluttering our entire house (which took about 2 months), we looked around and realized we could move to a new home. You see, we had been wanting and waiting to move for years. Some seven years ago, we tried to sell our house, but to no avail. After the decluttering marathon we put our house up for sale and it sold in 2 days. I kid you not. Now, I realize this is not a guaranteed result of reading the book and you may be happy in your own home and have no desire to move. But for us, going through this process helped us realize that we loved our home, but it was time to move on. Our house had served us well, but we were able to look at it clearly and see that it was ready for a new family. And we were ready for a new home. Which we have now and adore. In the last 6 months, my husband and I have often spoken of how that book changed our lives. It helped us get where we are now as well as getting us started off on the right foot in our new home. When I think about getting off on the right foot, it reminds me that the new year is here and I want to start fresh, as so many people do. Not with resolutions, exactly, but with small goals that will help focus my efforts in the new year. This year, I want to focus on things that spark joy. Yes, there are necessary activities and tasks that don’t exactly spark joy but often lead to things that do. For instance, scrubbing toilets very rarely sparks joy, however, having a sneaky clean bathroom does. ~ daily photography, whether it’s one or a dozen photos. Thanks to Kristin’s #imperfect366 project, I have gotten off to a pretty good start for that. If you, too, are hoping to just be more involved in picture taking this year, I urge you to check it out. It’s a ton of fun! ~ daily journaling whether it’s a handwritten to-do list, goals, or thoughts, I am trying to write a few words everyday. I have Kristin to thank for this one, as well, as it’s through her that I heard all about bullet journaling and I am intrigued. ~ have plants and fresh flowers around the house. We purchased a few fun, green houseplants to add some color and and life to our family room, which seemed sadly bare after our Christmas decorations came down. And I have been enjoying walking through the flower department at the grocery store to pick up a fresh bouquet here and there for something pretty to have around. 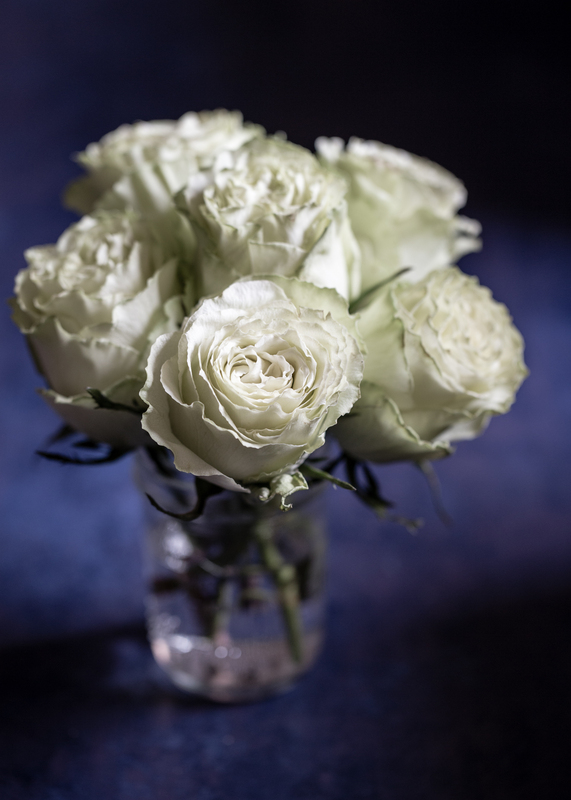 These green roses (pictured above) called to me with their ruffly petals. Now for the book that is truly spreading joy. 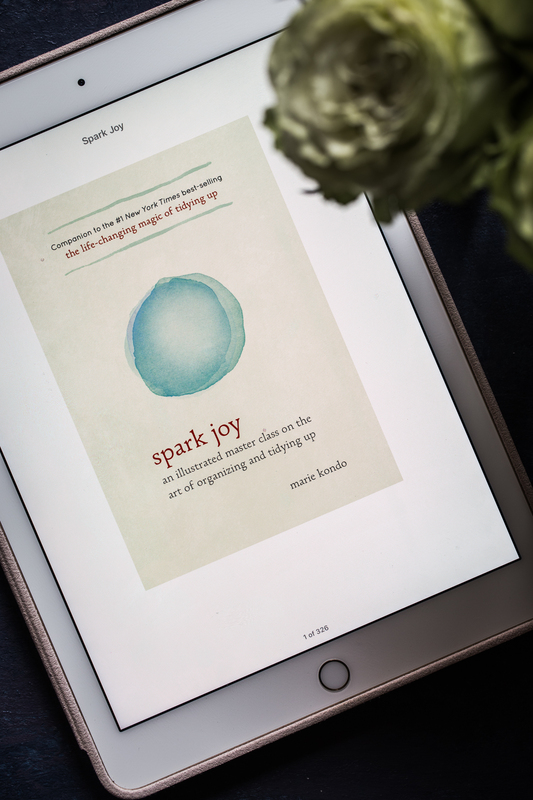 I was invited by Verizon to share a giveaway of 5 digital copies of Marie Kondo’s new book, Spark Joy. If you read her first book, like I did, her new book is an extension of that. 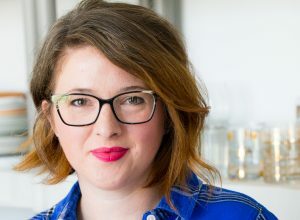 She goes further in depth on each category and how to not only declutter, but how to effectively organize all of the items in that category that do spark joy in your heart. The book is complete with illustrations on her clothes folding method and cabinet/closet storage techniques. I have been re-reading her first book to remind myself of the things that helped me so much last year, to make sure that I still have that goal of keeping only those items that spark joy in my home. Her new book is the perfect companion and extension of her first and I am so glad to have it. Having been a longtime Verizon customer, I was happy to be able to take part in last week’s #WhyNotWednesday when they were offering free digital copies of Spark Joy to all Verizon customers. Verizon has been offering these different real world experiences to their customers for a while now, such as offering free DeLorean rides in NYC back in October for Back to the Future Day. To be sure to not miss a week, be sure to check out www.whynotwednesday.com for a new offering every week. Leave one comment on this blog post telling me what you are hoping to declutter in the new year (from socks to spices). You must be a current Verizon customer. Entries will be accepted through Friday, 1/22/2016, at 9:00pm. Be sure to use a current email address when leaving your comment/entry as that will be how you are contacted if you are a winner. Winner’s will be chosen randomly and contacted via email. Verizon has kindly and generously provided me with the digital copies to giveaway to Jelly Toast readers. Thank you, Verizon! This is not a sponsored post. All opinions are 100% my own. Thank you for this book giveaway! I am hoping to declutter my son’s clothing and toys that no longer fit and he doesn’t use! Old magazines! I have stacks and stacks of magazines, both professional and personal, and they need to find a better home. Cheers to the new year, and thanks for the giveaway opportunity! Well, darling, just catching up with my feed. If you still have a code, is love the book. Why did I never know about Wednesday before? For rid of two bags of too small clothes in the article today! I would LOVE to receive this book. I have a couple of objectives! 1) My husband and I are newlyweds. We each owned a house prior to moving into “our” house and combining two households worth of stuff has resulted in so many redundancies! We can’t even park in the attached garage. 2) My 70-year-old mother-in-law is trying to adapt to living alone. She wants to list her 3-bedroom house for sale and move closer to us. She has a ton of knick-knacks and she is definitely going to have to purge before showing the house to potential buyers. I would like to share this knowledge with her! I need to go through the stuff in our attached garage so we might be able to park there! I also need to help my new-to-living-alone mother-in-law downsize so she can sell her house this year! I’ve tried several times to submit my comment and it doesn’t appear when I refresh. I apologize if you see multiple entries from me! I need to purge my attached garage and help my mother in law purge to sell her house! I have tried submitting this comment multiple times but cant see my comment when i refresh. I am so sorry if duplicates appear! My closet! I truly need a solution to my mess. I keep going in circles and it never ends.